Unity Mail is a new application for Unity to display the unread email count on the Unity launcher as well as new mail notifications using NotifyOSD. The application works with any IMAP4-compatible server, but the quicklists currently work with Gmail only (so you'll have to edit the launcher if you want quicklists for a different mail service). Unity Mail even has multiple accounts support but it has one drawback: the passwords are currently stored in plain text. On the other hand, Pidgin also stores the passwords in plain text and yet a lot of people use it anyway because if someone has physical access to your computer, he can do pretty much anything he wants. That of course doesn't mean the password shouldn't be stored in the keyring but this is the first Unity Mail release so hopefully it will use the GNOME Keyring in the future (I've submitted a bug about this already). 1. The icon doesn't show up in Dash for me, I really don't know why. So open Nautilus and go to /usr/share/applications/, look for "Unity Mail" and drag and drop the icon onto the Unity launcher. 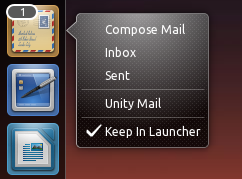 After an update, Unity mail is automatically added to the Unity launcher when you run it. 3. When you're done, save the file and press ALT + F2 again and run "unity-mail" again. That's it, now the mail icon you've added to the launcher under step 1 should now display a badge with your unread mail count. You'll also get NotifyOSD notifications each time you receive a new email. Unity-Mail will be automatically added to your startup applications so you don't have to add it manually. And use the same configuration as in the first unity-mail.conf file (but obviously, use a new username and password). For even more accounts, create ~/.config/unity-mail.2.conf, ~/.config/unity-mail.3.conf, etc.